Nations Press feature news WARNING:Nurse Detained in Saudi Arabia as Loan Guarantor-Family Appeals for Help! WARNING:Nurse Detained in Saudi Arabia as Loan Guarantor-Family Appeals for Help! A nurse from Panay Island who has been working in Saudi Arabia for 3 years has been detained for a debt of a Filipina friend she helped by acting as a loan guarantor. 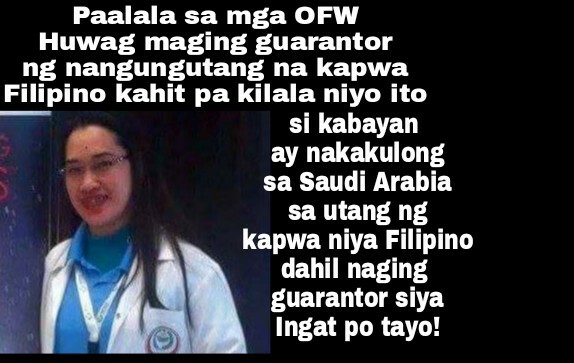 The 35-year-old named Gerlie Rubrico from the province of Iloilo could face imprisonment of up to two years if, as a loan guarantor, she fails to pay the debt because her friend who borrowed 330,000 Saudi riyals from a Saudi doctor already left the kingdom of Saudi Arabia. At the current exchange rate of P12.5 per Saudi Riyal, that would be P4.1 million pesos. The OFW has been in detention at the Al–Malaz prison in Riyadh since Dec. 28, 2015 upon the complaint of Dr. Huda Al Abbad, her colleague in one of the hospitals at the King Fahad Medical City – the largest medical facility in Saudi Arabia, according to the news report. The Filipina nurse could be imprisoned for up to two years for non-payment of debt and will received 52 to 56 lashes, according to her brother named Jerry.